A Little St. Patrick's Day History The First Parade The first St. Patrick's Day parade took place not in Ireland but in the United States. Irish soldiers serving in the English military marched through New York City on March 17, 1762. Along with their music, the parade helped the soldiers reconnect with their Irish roots, as well as fellow Irishmen serving in the English army. Over the next 35 years, Irish patriotism among American immigrants flourished, prompting the rise of so-called "Irish Aid" societies like the Friendly Sons of Saint Patrick and the Hibernian Society. Each group would hold annual parades featuring bagpipes (which actually first became popular in the Scottish and British armies) and drums. In 1848, several New York Irish Aid societies decided to unite their parades to form one New York City St. Patrick's Day Parade. Today, that parade is the world 's oldest civilian parade and the largest in the United States, with over 150,000 participants. Each year, nearly three million people line the 1.5-mile parade route to watch the procession, which takes more than five hours. Boston, Chicago, Philadelphia and Savannah also celebrate the day with parades involving between 10,000 and 20,000 participants. Wearing of the Green Goes Global Today, St. Patrick's Day is celebrated by people of all backgrounds in the United States, Canada and Australia. Although North America is home to the largest productions, St. Patrick's Day has been celebrated in other locations far from Ireland, including Japan, Singapore and Russia. In modern-day Ireland, St. Patrick's Day has traditionally been a religious occasion. In fact, up until the 1970s, Irish laws mandated that pubs be closed on March 17. Beginning in 1995, however, the Irish government began a national campaign to use St. Patrick's Day as an opportunity to drive tourism and showcase Ireland to the rest of the world. Last year, close to one million people took part in Ireland 's St. Patrick's Festival in Dublin, a multi-day celebration featuring parades, concerts, outdoor theater productions and fireworks shows. The Chicago River Chicago is famous for a somewhat peculiar annual event: dyeing the Chicago River green. The tradition started in 1962, when city pollution-control workers used dyes to trace illegal sewage discharges and realized that the green dye might provide a unique way to celebrate the holiday. 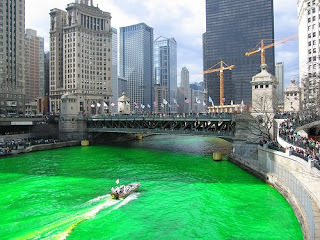 That year, they released 100 pounds of green vegetable dye into the river—enough to keep it green for a week! Today, in order to minimize environmental damage, only 40 pounds of dye are used, making the river green for only several hours. Did You Know? Many of us know that each year, thousands of Irish Americans gather with their loved ones on St. Patrick's Day to share a "traditional" meal of corned beef and cabbage. Yet, did you know that in 2007, roughly 41.5 billion pounds of U.S. beef and 2.6 billion pounds of U.S. cabbage were sold? Information for this blog was gathered from History.com . Irish or not, what a great day to celebrate. 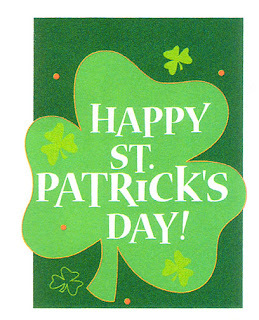 Happy St. Patrick's Day to all!